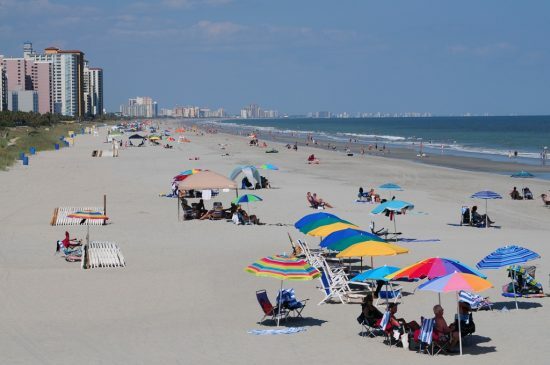 Myrtle Beach and the surrounding beach communities make up 60 miles of coast collectively known as the Grand Strand. More than 14 million visitors come to Myrtle Beach every year, and most of them are families with children. There are many kid-friendly hotels in Myrtle Beach, which is great for both the children and the parents. I am blessed to call Myrtle Beach home. My kids and I love living here, and they helped me create this list of the best things to do with kids. Of course, it goes without saying that the beach is the main attraction here. With more than 20 miles of sandy beaches along the Grand Strand, you’ll have no trouble carving out a place to sit and relax. Bring buckets, shovels, towels and lots of sunscreen to keep your family safe and entertained! As many times as we’ve gone, my kids still love a visit to Ripley’s Aquarium. Located at the Broadway at the Beach shopping and entertainment complex, Ripley’s Aquarium is a great place to spend a rainy day or just take a break from the sand and sun. 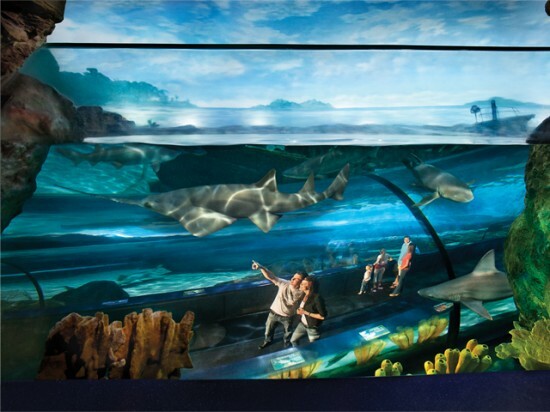 You can hop onto the moving walkway and get an underwater view of thousands of fish, including snappers, stingrays and huge sharks. Kids will also love the hands-on exhibits where they can hold a horseshoe crab or pet a stingray. Tickets are $22.99 for adults; $14.99 for kids 3-11; and free for children 2 and under. Save on admission with Ripley’s Myrtle Beach Aquarium Annual Pass! Buy today! OK, so my kids are too chicken to actually ride the 200-foot tall Skywheel, but they love admiring it from afar. The oceanfront Skywheel provides a fantastic light show at night, and it can be seen from piers and hotels all along the Grand Strand. For the record, it’s not a scary ride. You sit in a climate-controlled, enclosed glass gondola and get great views of the ocean. 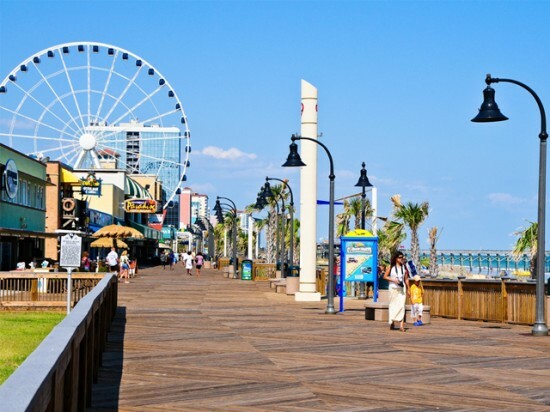 The Skywheel is located on the 1.2-mile boardwalk, which runs past ice cream shops, beach stores, restaurants and bars and a giant arcade. Plenty of fun for kids even if you don’t take a ride. Skywheel rides last about 8-12 minutes. Tickets are $13 for adults 12 and up, and $9 for children 3-11. We spend many days during the summer at the Wild Water and Wheels waterpark. The kids love the slides, wave pool and kiddie pools. I love that it’s a full day of fun without the sand, and they come home very tired. There are rides for every level of courage so it’s great for small kids and big kids alike. Tickets are $27.98 for visitors over 48″ tall; $17.98 for visitors under 48″ tall; and $17.98 for seniors over 55. Discounted admission rates are offered if you visit in the afternoon. Check website for details. Located south of Myrtle Beach in Pawleys Island, Brookgreen Gardens is a beautiful stretch of preserved land. You can spend a full day checking out the more than 1,000 sculptures, the lush gardens featuring native plants and flowers, and the zoo. 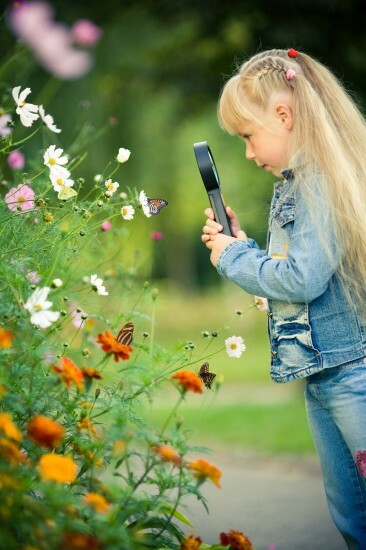 During the warmer months, the butterfly exhibit is a must-do for my kids. They also love watching the otters splash and play, which is on my top 10 list of cutest things I’ve ever seen. With live oaks more than 300 years old, you won’t feel like you’re in Myrtle Beach at Brookgreen Gardens. During the holidays, Brookgreen lights up with its “Nights of a Thousand Candles” event, where you can stroll the gardens by candlelight. It’s a great, quiet escape from the hustle of the beach. Tickets are $13 for adults over 12; 6 for children 6-12; and $11 for seniors 65 and over. Author Bio: Cassidy Strader is a mom of two and the editor of MyrtleBeach.com, a tourism website in Myrtle Beach, S.C.
« Camp Ice Age at Mall of America Opens Today!